A vibrant seaside community with boutique shops, mall, over 60 bars, restaurants and cafes, great swimming & sailing beach, walks, nearby lake, all only 10 min from Auckland CBD and most Auckland suburbs. Distance from the Takapuna Motor Lodge 2.8km (about 6 minutes drive). Entertainment and conference venue in the heart of Takapuna Beach. Distance from the Takapuna Motor Lodge 1.6km (about 4 minutes drive). Feed the ducks and swans, watch the mono-hull yacht racing, swim, kayak and picnic. There are heaps of things to do in and around Lake Pupuke. Distance from Takapuna Motor Lodge 1 km (about 2 minutes drive). The North Shore Events Centre (NSEC) is the home of the back to back championship winning SKYCITY Breakers as well as being host to many community sports programs and events. Distance from Takapuna Motor Lodge 2.1km (about 4minutes drive). A restaurant and theatre venue on the shores of Lake Pupuke. Distance from the Takapuna Motor Lodge 3.3Km (about 6 minutes drive). One of the North Shores most picturesque and safe beaches with a beachside park and family picnic areas open to the public, and a popular beach walk linking Milford to Takpauna Beach. 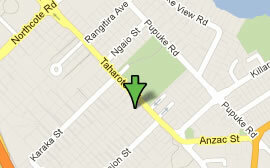 Distance from Takapuna Motor Lodge 3.4km (about 6 minutes). Takapuna is a delightful, seaside suburb of North Shore City, located to the north of centralAuckland City. Takapuna is the ideal destination for a holiday as it offers a number of attractions for the whole family. Distance from Takapuna Motor Lodge 1.6km (about 4 mins drive). The Takapuna Market is a regular Sunday morning fixture at the municipal car park in Anzac St. Held every week from 6am to 12pm, the market has everything you can imagine, from food and clothes to trinkets galore. The fresh local produce is fabulous. If you're a serious shopper, you should arrive well before 9am for the pick of the day's fresh produce and flowers. If you're after a bargain, have a look around nearer to the midday closing time when many stallholders will do some great deals because they don't want to take anything home with them. Distance from the Takapuna Motor Lodge 1.0km (about 2 minutes drive). An 18 hole golf course, late night driving range, gold pro shop with a full range of the latest golf gear and golf pro’s in attendance. Distance from the Takapuna Motor Lodge, 1.4km (about 3 minutes drive). On The Promenade Takapuna with panoramic views of Rangitoto and the Waitemata Harbour. Gourmet take out food for home or the beach. Dine in or take-away. Distance from Takapuna Motor Lodge, 1.7km (about 4 minutes drive). New Zealand’s largest shopping mall with shopping, dining and movie theatres. Distance from Takapuna Motor Lodge, 11.2km (about 12 minutes drive). A wealth of information about the beaches, dining, accommodation, events, operators and attractions of North Shore, Auckland. The distance to the Tourism Centre is 1.6km (about 4 minutes drive) from Takapuna Motor Lodge. Tourism information for Auckland New Zealand including accommodation, tours, activities, attractions, transport, maps, weather & more for planning your Auckland holiday. A great New Zealand vacation & holiday planning resource. Hundreds of searchable listings for accommodation, activities, tourist attractions, tours, transport, travel agents, tourism guides, maps & more. Independent rugby guide for supporters travelling New Zealand for Super Rugby, Bledisloe Cup, Tri Nations & other rugby games with info on accommodation, campervan hire, venues, games fixtures, local tips, latest news and more. Small group, guided multi day adventure tours for sophisticated travellers seeking an active New Zealand vacation with opportunities to try new activities and gain an insight into our culture.